« Parlez-vous Français? Would you like to learn or brush up on your French before you next visit to St. Barts? John Casey, who is the U.S. Multihull Champion, has fallen in love with St. Barts, too! I am pleased to present his first guest blog with hopes of more to come. With St. Barthélemy’s rich sailing tradition, being discovered by Columbus in 1493 and used by French pirates to stash Spanish galleon spoils, the eight square mile island has remained a number one world sailing destination. The next year, 2010, I came back to race the CataCup and we improved to first place! Then I really thought it was a place for me. 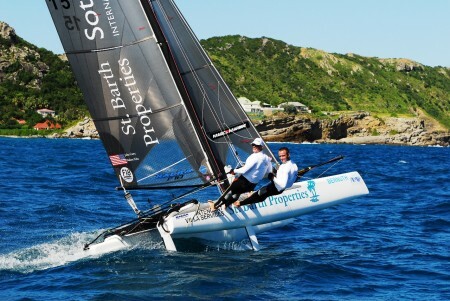 During that regatta Peg and I decided to create the St. Barth Properties Sotheby’s International Realty sailing team. I thought it was a perfect fit. St. Barth is one of the loveliest sailing locations in the world with its green way of living and rich sailing history. Peg and St. Barth Properties have been winning as many awards as hotel and villa specialists as I have for sailboat racing, so it was easy for us to develop a winning strategy. Our eye on success was unwavering and last year the St. Barth Properties Sotheby’s International Realty sailing team earned a second place in the CataCup against world champion and Olympic competition. This year we are back stronger than ever! We have a new boat, new sails and a continued great relationship. 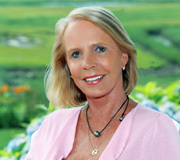 A big thanks to Peg and the St. Barth Properties Sotheby’s International Realty team for helping us live our dream! This entry was posted on Wednesday, June 20th, 2012 at 11:59 am	and is filed under Activities. You can follow any responses to this entry through the RSS 2.0 feed. You can leave a response, or trackback from your own site. I’ve heard of the Saint Barth Cata Cup and watched few videos over Youtube. After reading your blog, I am excited to visit St.Barts and watch the competition for real. It’s good to know that it is going to be held in November this year, perfect time for me to travel. Looking forward to see the action. Thanks so much for the article. I’ve been to St. Bart’s once before and I have to completely agree with you – pristine beaches, everyone seems to be involved in purposeful activity. It feels like there is a balance between work and relaxation there. And of course, who ca forget the Catac Cup?